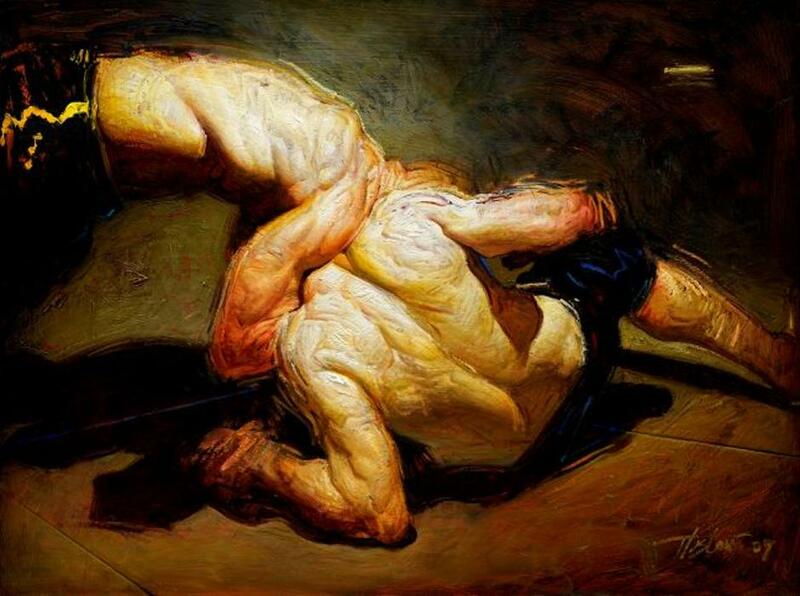 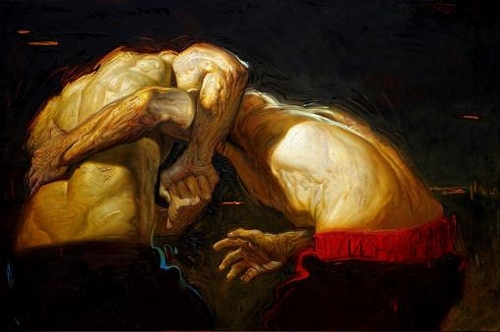 Taut Oil On Canvas 60" X 72"
Going Down Oil On Panel 36" X 48"
The Arm Bar Oil On Canvas 48" X 72"
The Clench Oil On Panel 16" X 24"
Headlock Oil On Panel 36" X 48"
Steve Huston was born and raised in Anchorage, Alaska. 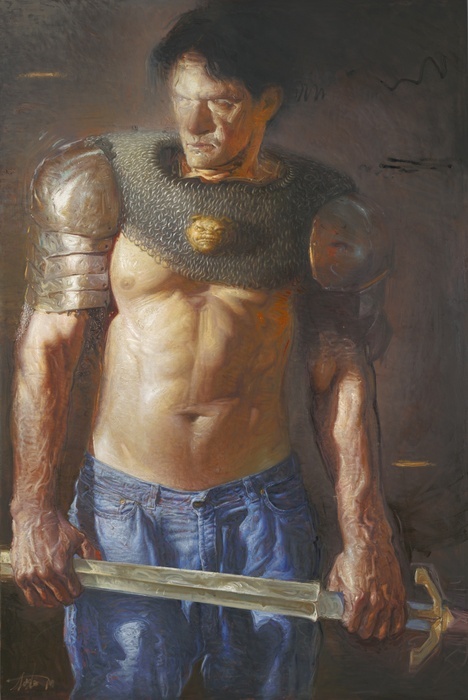 He moved to California at the age of 20 to earn his BFA degree from the Art Center College of Design in Pasadena where he later taught for many years. Huston’s artistic vision transitions from depicting isolated figures to representing multiple figures celebrating the motion of common day laborers. 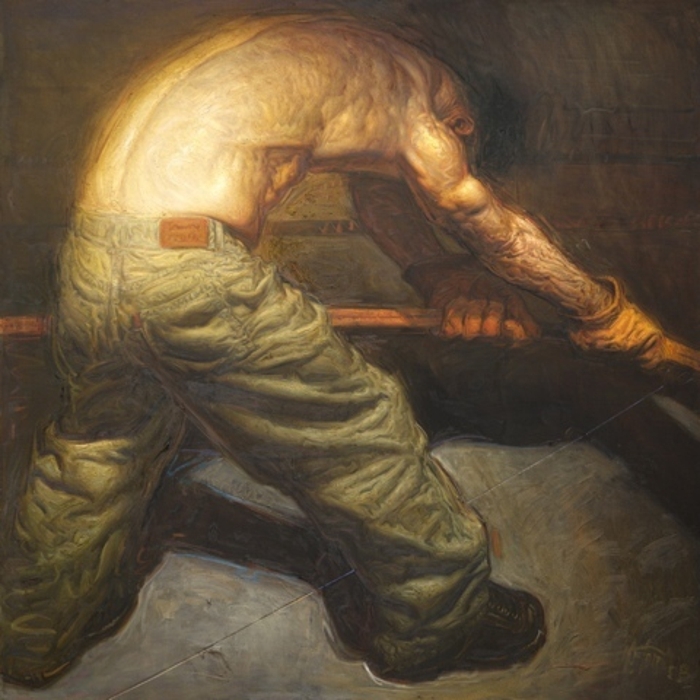 Huston takes the viewer on a nostalgic journey into the history of the American work ethic commemorating its continuation into our post-industrial society. 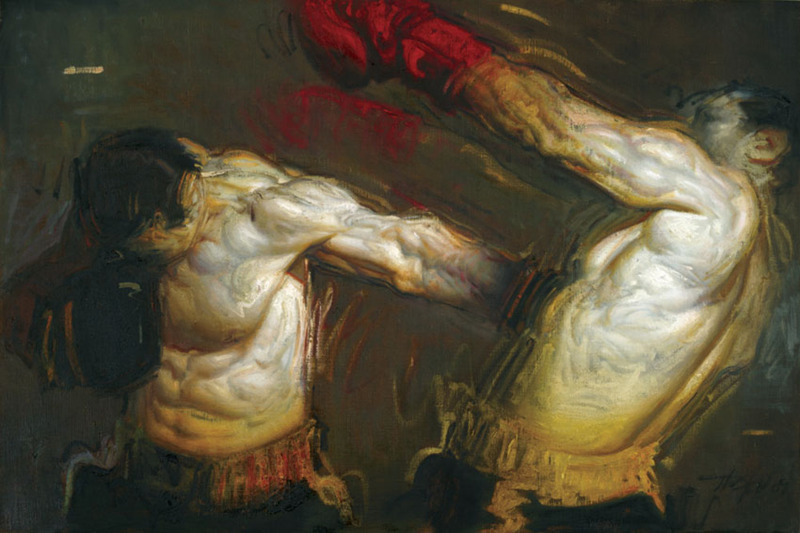 Huston stylistically paints muscular men who sacrifice their bodies for their accomplishments, yet he elevates their status with a valiant quality. 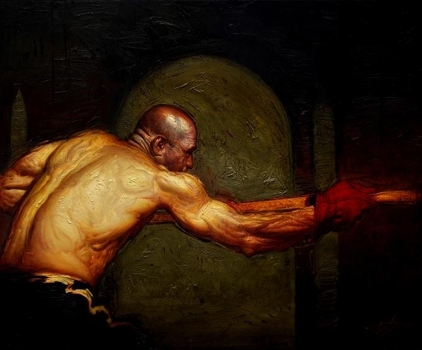 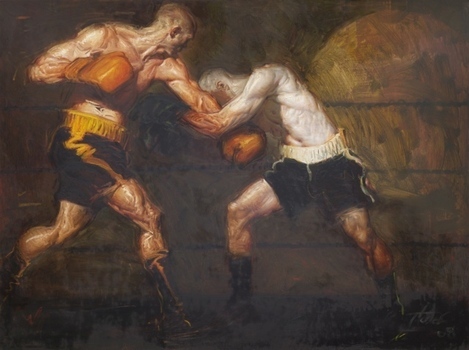 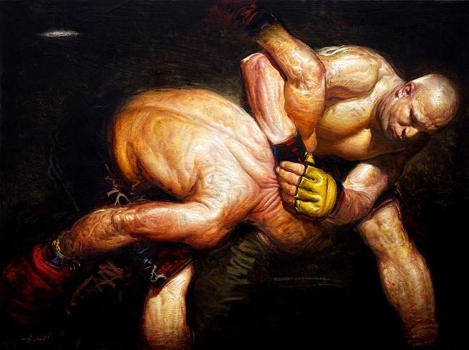 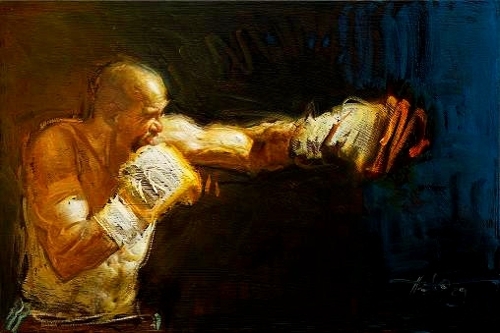 Often depicting boxers or construction workers, he approaches these subjects with the same veneration old masters approached Baroque religious paintings. 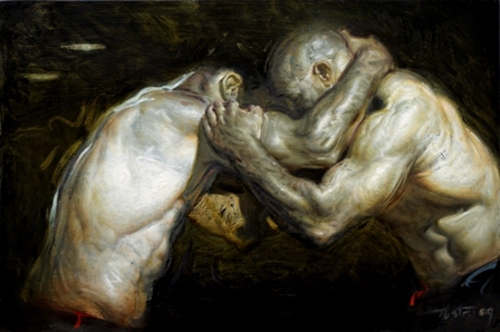 There is a strong sense of light cast among the figures as though they are being illuminated by a central source. 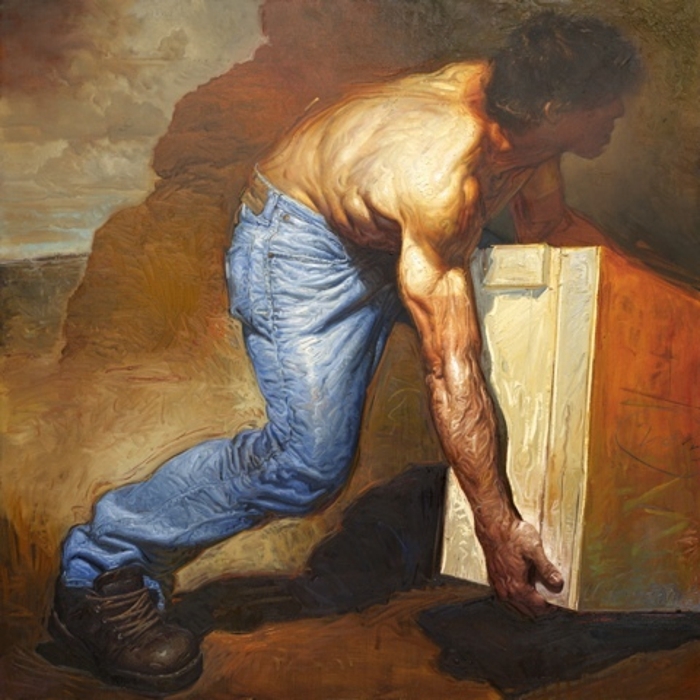 The technique in which he paints the figures creates as sense of movement and energy; even though the image is pictorial it is never stagnant. Huston recognizes the beauty and honors the dignity and heroism of hard working individuals and the American battle of man versus machine. The uniting force of humanity is the everyday struggle that we all endure; Huston honors these qualities with his emphasis on action, describing the structures of the human body with a combination of charm, accuracy and rippling lines of musculature. 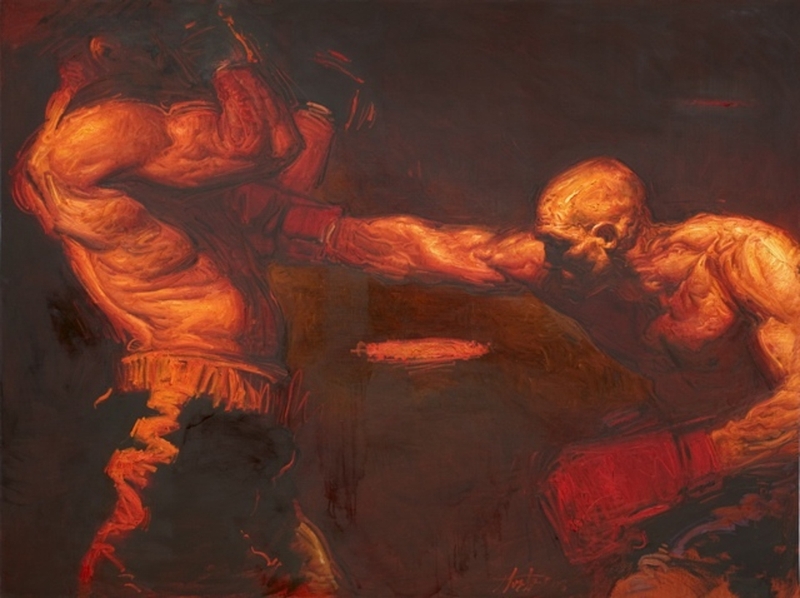 Huston’s work has been acquired by public and private collections including Caesar’s Palace, Columbia Pictures, The Pacific Club and Universal Pictures. 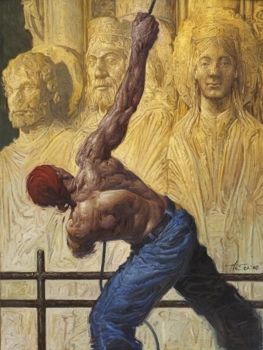 Huston’s profession as a fine artist started thriving in 1995, winning honorable awards at the California Art Club Gold Medal Show. Then came a chain of gallery exhibitions, first in Los Angeles and then New York and Europe. Huston continues to show his work broadly giving lectures across the country.